Sun beams striking through the rainforest onto a beautiful wilderness waterfall on the west coast of Vancouver Island, British Columbia, Canada. It is always a nice change to see some sun while being in a rainforest. In this case it was especially beautiful as the steam helped to lighten up sun beams which were hitting this beautiful waterfall in the wilderness along the west coast of Vancouver Island. The sun beams adding some highlights on the waterfall which makes this pictures especially interesting. Virgin Falls waterfall can be reached via pretty bad gravel roads. It can take about 4-5 hours from Tofino to reach them. make sure to have more then enough spare tires when you try to get to the waterfall. There is hardly any traffic on the road. The drive is a beautiful wilderness experience with many scenic photo opportunities along the way. Virgin Falls plunging 53 metres/174 feet in a fan formation down a rock escarpment along the Tofino Creek with rays of sunlight streaming through the trees, a transition area of the Clayoquot Sound UNESCO Biosphere Reserve, Vancouver Island, British Columbia, Canada. 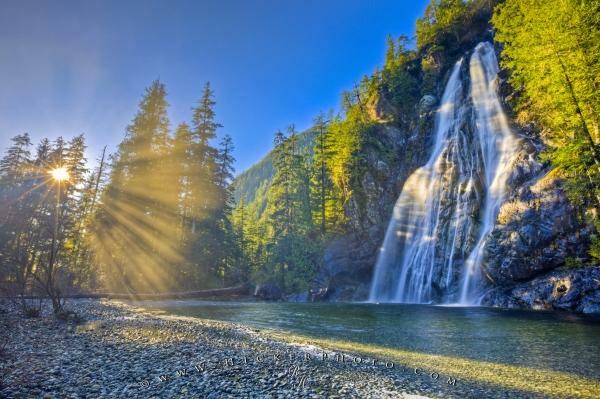 Photo of sun beams hitting Virgin falls waterfall in the wilderness of Vancouver Island, BC, Canada.